Mr. Thomas Lightfoot was born died at a little village called Shelton, in the parish of Stoke upon Trent in Staffordshire. He was in holy orders six and fifty years, and was thirty-six vicar of Uttoxeter. He died July the 21st, 1658, in the eighty-first year of his age. He married Mrs. Klizabeth Hagrial, a gentlewoman of very good family; three of which family were made knights by queen Elizabeth for their valour in the wars in Ireland. She died January the 24th, 1636, at the age of seventy-one. 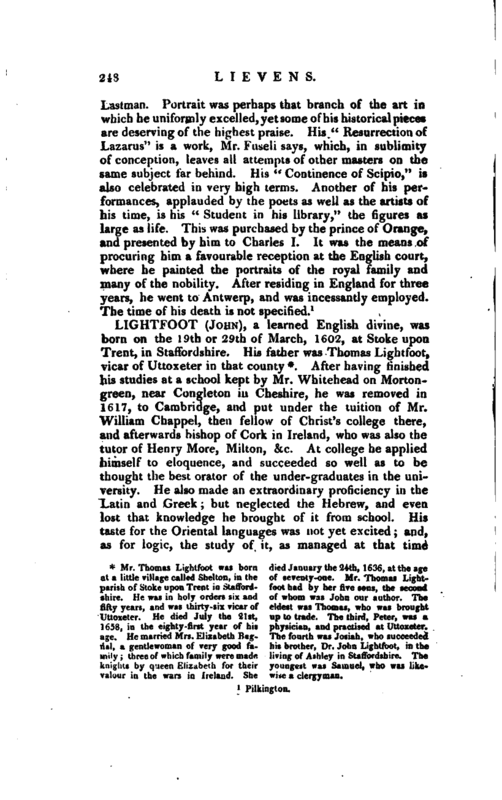 Mr. Thomas Lightfoot had by her five sons, the second of whom was John our author. The eldest was Thomas, who was brought up to trade. The third, Peter, was a physician, and practised at Uttoxeter. 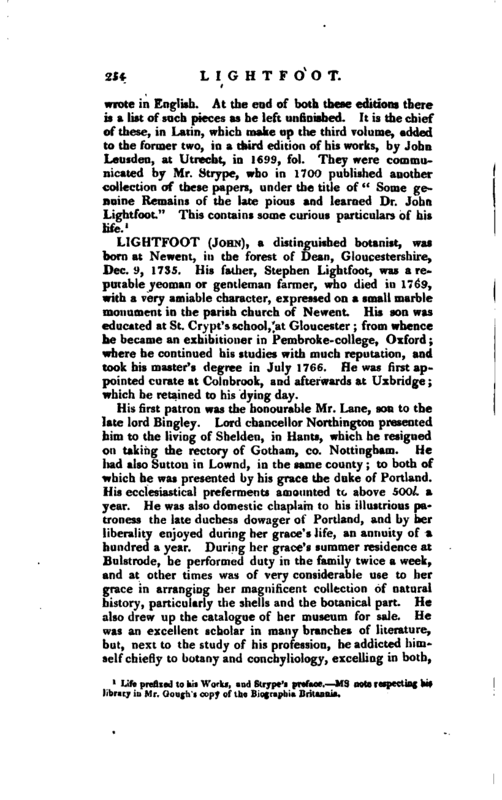 The fourth was Josiah, who succeeded his brother, Dr. John Lightfoot, in the living of Ashley in Staftbidshire. The youngest was Samuel, who was also a clergyman. After having finished his studies at a school kept by Mr. Whitehead on Mortongreen, near Congleton in Cheshire, he was removed in 1617, to Cambridge, and put under the tuition of Mr. William Chappel, then fellow of Christ’s college there, and afterwards bishop of Cork in Ireland, who was also the tutor of Henry More, Milton, &c. At college he applied himself to eloquence, and succeeded so well as to be thought the best orator of the undergraduates in the uni versity. He also made an extraordinary proficiency in the Latin and Greek; but neglected the Hebrew, and even lost that knowledge he brought of it from school. His taste for the Oriental languages was not yet excited; and, as for logic, the study of it, as managed at that time | among the academics, was too contentious for his quiet and meek disposition. As soon as he had taken the degree of B. A. he left the university, and became assistant to his former master, Mr. Wbitehead, who then kept a school at Repton, in Derbyshire. After he had supplied this place a year or two, he entered into orders, and became curate of Norton under Hales, in Shropshire. This curacy gave an occasion of awakening his genius for the Hebrew tongue. Norton, lies near Bellaport, then the seat of sir Rowland Cotton, who was his constant hearer, made him his chaplain, and took him into his house. This gentleman being a perfect master of the Hebrew language, engaged Lightfoot in that study; who, by conversing with his patron, soon became sensible, that, without that knowledge, it was impossible to attain an accurate understanding of the Scriptures. He therefore applied himself to it with extraordinary vigour and success; and his patron removing, with his family, to reside in London, at the request of sir Allan Cotton, his uncle, who was lord-mayor of that city, he followed his preceptor thither. 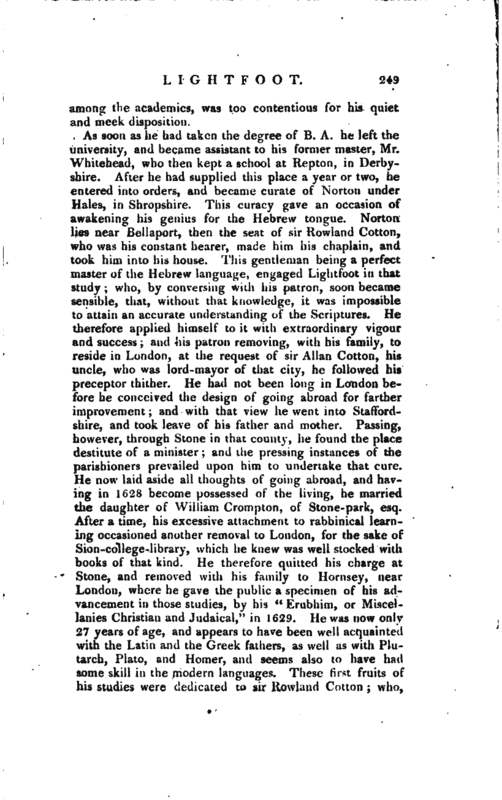 He had not been long in London before he conceived the design of going abroad for farther improvement; and with that view he went into Staffordshire, and took leave of his father and mother. Passing, however, through Stone in that county, he found the place destitute of a minister; and the pressing instances of the parishioners prevailed upon him to undertake that cure. He now laid aside all thoughts of going abroad, and having in 1628 become possessed of the living, he married the daughter of William Crompton, of Stone-park, esq. After a time, his excessive attachment to rabbinical learning occasioned another removal to London, for the sake of Sion-college-library, which he knew was well stocked with books of that kind. He therefore quitted his charge at Stone, and removed with his family to Hornsey, near London, where he gave the public a specimen of his ad-? vancement in those studies, by his “Erubhirn, or Miscellanies Christian and Judaical,” in 1629. He was now only 27 years of age, and appears to have been well acquainted with the Latin and the Greek fathers, as well as with Plutarch, Plato, and Homer, and seems also to have had some skill in the modern languages. These first fruits of his studies were dedicated to sir Rowland Cotton; who, | in 1631, presented him to the rectory of Ashley, in Staffordshire. Thinking himself now fixed for life, he built a study in the garden, retired from the noise of the house; and applied himself for twelve years with indefatigable diligence in searching the Scriptures. 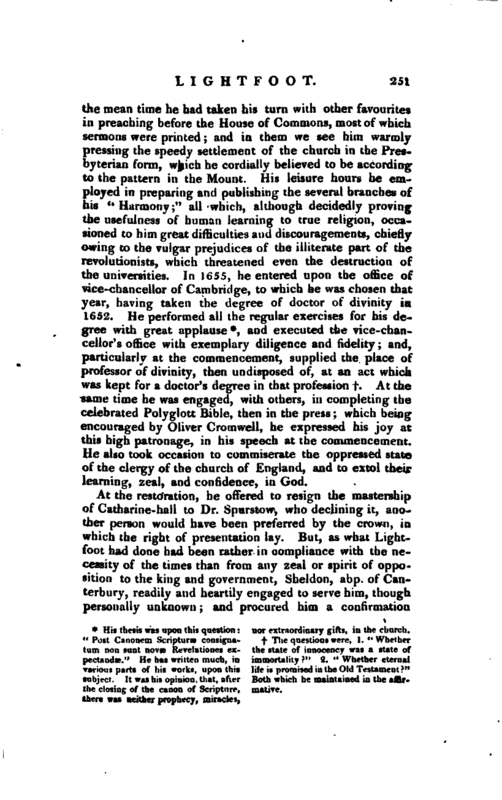 Thus employed, the day* passed very agreeably; and he continued quiet and unmolested till the great change which happened in the public affairs, brought him into a share of the administration relating to the church; for he was nominated a member of the memorable assembly of divines, for settling a new form of ecclesiastical polity. 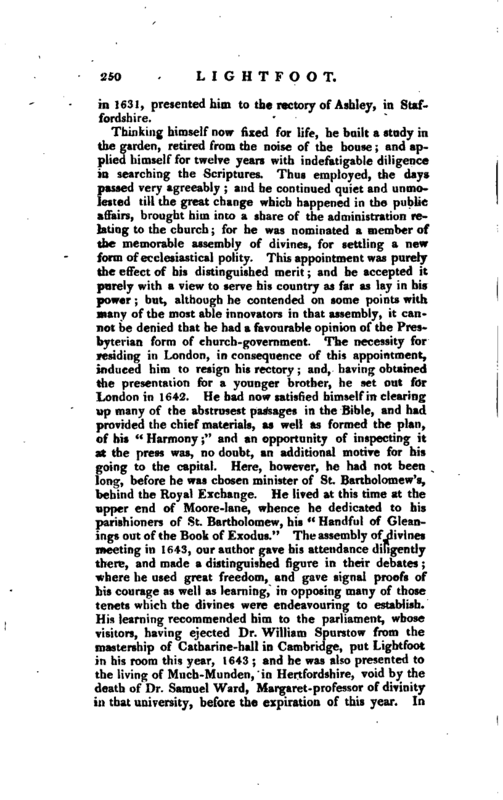 This appointment was purely the effect of his distinguished merit; and he accepted it purely with a view to serve his country as far as lay in his power; but, although he contended on some points with many of the most able innovators in that assembly, it cannot be denied that he had a favourable opinion of the Presbyterian form of church- government. The necessity for residing in London, in consequence of this appointment, induced him to resign his rectory; and, having obtained the presentation for a younger brother, he set out for London in 1642. He had now satisfied himself in clearing up many of the abstrusest passages in the Bible, and had provided the chief materials, as well as formed the plan, of his “Harmony;” and an opportunity of inspecting it at the press was, no doubt, an additional motive. for his going to the capital. Here, however, he had not beert long, before he was chosen minister of St. Bartholomew’s, behind the Royal Exchange. He lived at this time at the upper end of Moore-lane, whence he dedicated to his parishioners of St. Bartholomew, his “Handful of Gleanings out of the Book of Exodus.” The assembly of divines meeting in lf>43, our author gave his attendance diligently there, and made a distinguished figure in their debates; where he used great freedom, and gave signal proofs of his courage as well as learning, in opposing many of those tenets which the divines were endeavouring to establish. His learning recommended him to the parliament, whose visitors, having ejected Dr. William Spurstow from the mastership of Catharine-hall in Cambridge, put Lightfoot in his room this year, 1643; and he was also presented to the living of Much-Mundeii, in Hertfordshire, void by the death of Dr. Samuel Ward, Margaret- professor of divinity in that university, before the expiration of this year. In | the mean time he had taken his turn with other favourites in preaching before the House of Commons, most of which sermons were printed; and in them we see him warmly pressing the speedy settlement of the church in the Presbyterian form, w^ich he cordially believed to be according to the pattern in the Mount. His leisure hours he employed in preparing and publishing the several branches of his “Harmony;” all which, although decidedly proving the usefulness of human learning to true religion, occasioned to him great difficulties and discouragements, chiefly owing to the vulgar prejudices of the illiterate part of the revolutionists, which threatened even the destruction of the universities. In 1655, he entered upon the office of vice-chancellor of Cambridge, to which he was chosen that year, having taken the degreeof doctor of divinity in 1652. 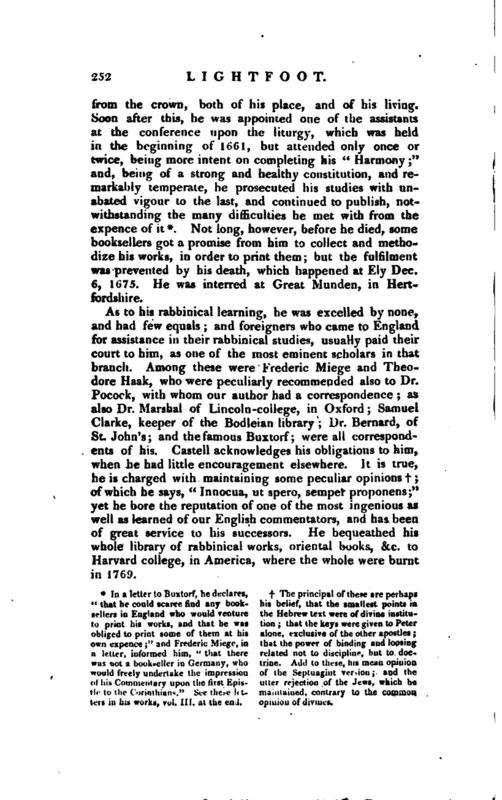 He performed all the regular exercises for his degree with great applause*, and executed the vice-chancellor’s office with exemplary diligence and fidelity; and, particularly at the commencement, supplied the place of professor of divinity, then undisposed of, at an act which was kept for a doctor’s degree in that profession f. At the same time he was engaged, with others, in completing the celebrated Polyglott Bible, then in the press; which being encouraged by Oliver Cromwell, he expressed his joy at this high patronage, in his speech at the commencement. He also took occasion to commiserate the oppressed state of the clergy of the church of England, and to extol their learning, zeal, and confidence, in God. * His thesis was upon this question: nor extraordinary gifts, in the church. various parts of his works, upon this life js promised in the Old Testament?" In a letter to Buxtorf, he declares, “that he could scarce find any booksellers in England who would venture to print his works, and that he was obliged to print some of them at his own expence” and Frederic Miegc, in a letter, informed him, “that there was not a bookseller in Germany, who would freely undertake the impression of his Commentary upon the first Epistie to the Corinthians.” See the~> letters in his works, vol. III. at the end. Not long, however, before he died, some booksellers got a promise from him to collect and methodize his works, in order to print them; but the fulfilment was prevented by his death, which happened at Ely Dec. 6, 1675. He was interred at Great Munden, in Hertfordshire. As to his rabbinical learning, he was excelled by none, and had few equals; and foreigners who came to England for assistance in their rabbinical studies, usually paid their court to him, as one of the most eminent scholars in that branch. Among these were Frederic Miege and Theodore Haak, who were peculiarly recommended also to Dr. Pocock, with whom our author had a correspondence as also Dr. Marshal of Lincoln-college, in Oxford Samuel Clarke, keeper of the Bodleian library Dr. Bernard, of St. John’s; and the famous Buxtorf were all correspondents of his. Castell acknowledges his obligations to him, when he had little encouragement elsewhere. It is true, he is charged with maintaining some peculiar opinions t; of which he says, “Innocua, ut spero, semper proponens;” yet he bore the reputation of one of the most ingenious as well as learned of our English commentators, and has been of great service to his successors. He bequeathed his whole library of rabhinical works, oriental books, &c. to Harvard college, in America, where the whole were burnt in 1769. The principal of these are perhaps his belief, that the smallest points in the Hebrew text were of divine institution; that the keys were given to Peter alone, exclusive of the other apostles; that the power of binding and loosing related not to discipline, but to doctrine. Add to these, his mean opinion of the Septuagint rrrrion; and the utter rejection of the Jews, which he maintained, contrary to the common opinion of divines. | The doctor was twice married; his first wife, already mentioned, brought him four sons and two daughters. His eldest son, John, who was chaplain to Bryan Walton, bishop of Chester, died soon after that prelate. 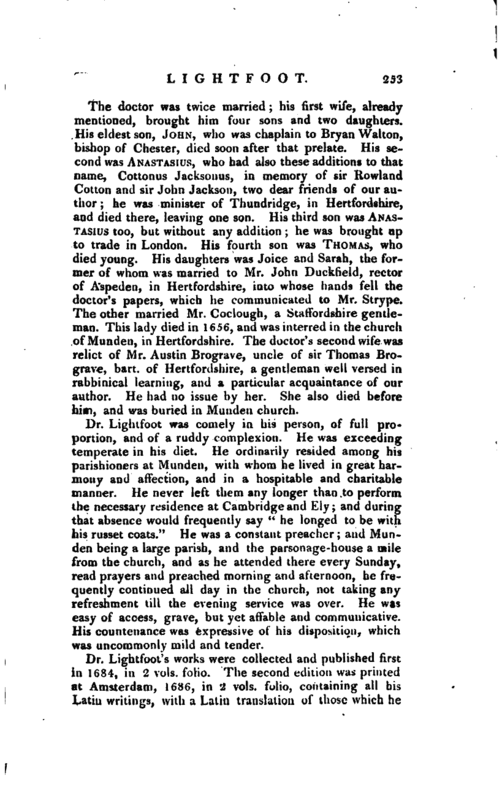 His second was Anastasius, who had also these additions to that name, Cotton us Jackson us, in memory of sir Rowland Cotton and sir John Jackson, two dear friends of our author; he was minister of Thundridge, in Hertfordshire, and died there, leaving one son. His third son was Anas­Tasius too, but without any addition; he was brought up to trade in London. His fourth son was Thomas, who died young. His daughters was Joice and Sarah, the former of whom was married to Mr. John Duckfield, rector of Aspeden, in Hertfordshire, into whose hands fell the doctor’s papers, which he communicated to Mr. Strype. The other married Mr. Coclough, a Staffordshire gentleman. This lady died in 1656, and was interred in the church of Munden, in Hertfordshire. The doctor’s second wife was relict of Mr. Austin Brograve, uncle of sir Thomas Brograve, bart. of Hertfordshire, a gentleman well versed in rabbinical learning, and a particular acquaintance of our author. He had no issue by her. She also died before him, and was buried in Munden church. Df. Lightfoot was comely in his person, of 'full proportion, and of a ruddy complexion. “He was exceeding temperate in his diet. He ordinarily resided among his parishioners at Munden, with whom he lived in great harmony and affection, and in a hospitable and charitable manner. He never left them any longer than to perform, the necessary residence at Cambridge and Ely; and during that absence would frequently say” he longed to be with his russet coats." He was a constant preacher; and Munderr being a large parish, and the parsonage-house a mile from the church, and as he attended there every Sunday, read prayers and preached morning and afternoon, he frequently continued all day in the church, not taking any refreshment till the evening service was over. He was easy of access, grave, but yet affable and communicative. His countenance was expressive of his disposition, which was uncommonly mild and tender.